The series will publish works on theory, research and critical views on the state of theorizing, researching, studying and applying the concept of the ‘international’ in Southeast Asia by prominent, emerging and novice scholars. It highly welcomes works that forges a link between disciplinary IR’s theoretical richness and area study of Southeast Asia’s empirical application, e.g. field research. 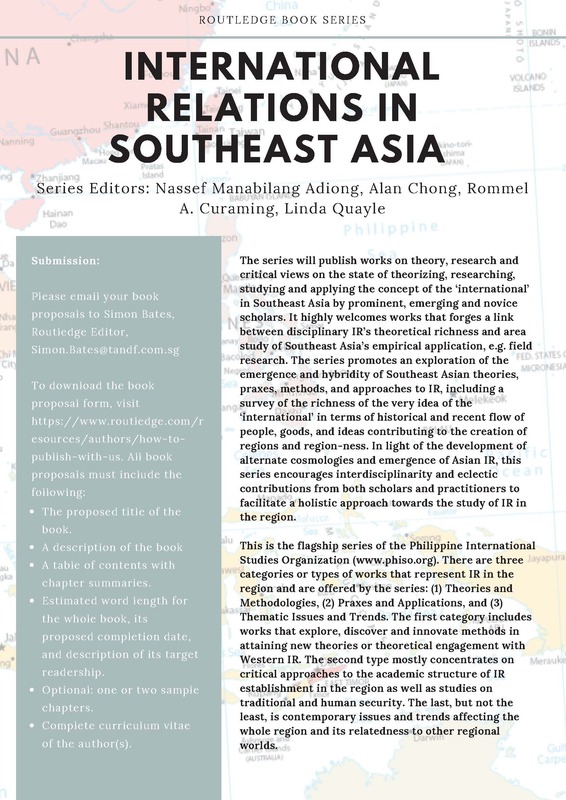 The series promotes an exploration of the emergence and hybridity of Southeast Asian theories, praxes, methods, and approaches to IR, including a survey of the richness of the very idea of the ‘international’ in terms of historical and recent flow of people, goods, and ideas contributing to the creation of regions and region-ness. In light of the development of alternate cosmologies and emergence of Asian IR, this series encourages interdisciplinarity and eclectic contributions from both scholars and practitioners to facilitate a holistic approach towards the study of IR in the region. Submission: Please send your book proposals and inquiries to Simon Bates, the Editor for Asian Studies, at Simon.Bates@tandf.com.sg.